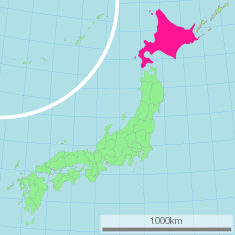 Hokkaidō (北海道, literally "North Sea Circuit"), formerly known as Ezo, Yezo, Yeso, or Yesso, is Japan's second largest island and the largest, northernmost, and most sparsely populated of its 47 prefectural-level subdivisions. The Tsugaru Strait separates Hokkaidō from Honshū, although the two islands are connected by the underwater Seikan Tunnel. The largest city on Hokkaidō is its capital, Sapporo, which is also its only ordinance-designated city. Hokkaidō did not officially become part of Japan until 1868, and until the 1800s, the population of Ainu outnumbered the number of Japanese living on the island. Nearly one-fourth of the Japan’s arable land is on Hokkaidō, and it ranks first in the nation for its production of wheat, soybeans, potatoes, beets and other field crops, onions, pumpkins, corn and other vegetables, raw milk, beef, and a number of other farm products. Forests, covering 70 percent of the prefecture, are a source of lumber, pulp, and paper (milled in Hokkaido). Japanese tourists enjoy traveling to Hokkaido to visit hot springs and enjoy its scenic beauty and its national parks. In winter, the generally high quality of powder snow and numerous mountains in Hokkaidō make it one of Japan's most popular regions for snow sports. Hokkaidō celebrates its winter weather at the Sapporo Snow Festival. The Winter Olympics were held in Sapporo in 1972. In 1876, William S. Clark, a Christian educator, founded an agricultural college in Sapporo city. He encouraged his students to sign a "covenant in Christ" and many did. Although he stayed only one year, his presence greatly affected intellectual leaders of the Meiji period; among those who became leading Christian intellectuals were Uchimura Kanzo and Nitobe Inazo. Clark's parting words "Boys, be ambitious!" is now one of the best remembered phrases in Japanese history. Archeologists theorize that Hokkaidō was settled by Ainu, Gilyak, and Oroke 20,000 years ago. The Nihonshoki is often said to be the first mention of Hokkaidō in recorded history. According to the text, Abe no Hirafu led a large navy and army to northern areas from 658 to 660 and came into contact with the Mishihase and Emishi. One of the places Hirafu traveled to was called Watarishima (渡島), which is often believed to be present-day Hokkaidō. Many theories exist concerning the details of this event, including the specific location of Watarishima and the common belief that the Emishi in Watarishima were the ancestors of the present-day Ainu people. During the Nara and Heian periods, people in Hokkaidō conducted trade with Dewa Province, an outpost of the Japanese central government. During the medieval ages, the people of Hokkaidō began to be called Ezo. Around the same time Hokkaidō came to be called Ezochi (蝦夷地) or Ezogashima. The Ezo mainly relied upon hunting and fishing and obtained rice and iron through trade with the Japanese. During the Muromachi period (1336- 1573), the Japanese created a settlement at the south of the Oshima peninsula. As more people moved to the settlement, disputes arose between the Japanese and the Ainu and eventually developed into a rebellion. Takeda Nobuhiro killed the Ainu leader, Koshamain in 1456, and crushed the rebellion. Nobuhiro's descendants became the rulers of the Matsumae-han, which dominated the south of Ezochi until the end of the Edo period. Matsumae-han's economy relied upon trade with the Ainu. The Matsumae family was granted exclusive trading rights with the Ainu in the Azuchi-Momoyama and Edo periods. The Japanese settlers, who called themselves Wajin, were known as Shamo to the Ainu. Wajin merchants exchanged knives, rice, sake and cloth with Ainu villages (kotans) for salmon and animal skins. In 1617, alluvial gold was discovered in a river valley 18 kilometers north of Matsumae, Ezo's only castle town. Prospectors began to arrive from Honshu, followed by fishermen, merchants, and Christians fleeing from the persecution of the Tokugawa government. In 1639, 106 Ezo Christians were rounded up and executed. In June 1669, the Ainu again rose in rebellion, angered by the settlers’ encroachment on their territory and the pollution of their salmon fisheries by gold prospectors. Shakushain, an Ainu leader, and 1,000 followers, armed with bows and poison-tipped arrows, marched from Shizunai toward Matsumae, torching boats and huts and slaughtering gold prospectors, merchants and fishermen along the way. The Ainu faced the Wajin forces across a river at Oshamambe, but their arrows were no match for Wajin guns, and they retreated. In October, Shakushain was murdered on his way to negotiate peace. In 1798, the Tokugawa Shogunate realized that there was a need to prepare northern defenses against possible Russian invasion and took over control of Ezochi. The Shogunate made the Ainu burden slightly easier, but did not change the overall form of rule. In 1821, the Matsumae clan regained control until 1854, when the shogunate reestablished itself. Shortly after the Boshin War in 1868, a group of Tokugawa loyalists led by Enomoto Takeaki proclaimed the island's independence as the Republic of Ezo, but the rebellion was crushed in May 1869. Ezochi was subsequently put under control of Hakodate-fu (箱館府, Hakodate Prefectural Government). In 1869, the Meiji government established a Development Commission (開拓使) in Ezo-chi and changed the island’s name to Hokkaido (北海道). The primary purpose of the Development Commission was to secure Hokkaidō before the Russians extended their control of the Far East beyond Vladivostok. Kuroda Kiyotaka was put in charge, and journeyed to the United States to recruit Horace Capron, President Grant's Commissioner of Agriculture. From 1871 to 1873, Capron made an effort to promulgate Western methods of agriculture and mining, with mixed results. Frustrated by the obstacles he encountered, Capron returned home in 1875. In 1876, William S. Clark arrived to found an agricultural college in Sapporo. Although he only remained there one year, Clark left a lasting impression on Hokkaidō, inspiring the Japanese with his teachings on agriculture as well as Christianity. Clark encouraged his students to sign a "covenant in Christ" and many followed. Notable Christian such as Kanzo Uchimura and Nitobe Inazo encountered with Christianity there and became leading Christian intellectuals in Japan. 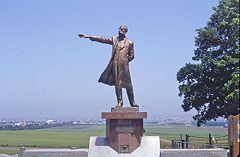 His parting words, "Boys, be ambitious," can be found on public buildings in Hokkaidō to this day. During the decade from 1868 to 1878, the population of Hokkaidō exploded from 58,000 to 240,000. Settlers included dispossessed farmers, political dissidents and families in search of a way to make a living. In 1890, coal was discovered at Yubari. When Japan invaded China in 1894, the increased demand for coal sparked a surge in Hokkaido’s coal-mining industry. Before World War II, there were over 200 coal mines in Hokkaido. Cheaper foreign imports and a shift in the 1960s, to oil as a source of energy eventually resulted in the closing of Hokkaido’s Taiheiyo Coal Mine, Japan’s last large-scale coal mine, in 2002. In 1882, when the Development Commission was abolished, Hokkaidō was separated into three prefectures, Hakodate (函館県), Sapporo (札幌県), and Nemuro (根室県). 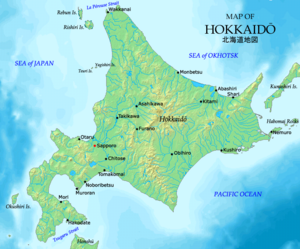 In 1886, the three prefectures were abolished, and Hokkaidō was put under the Hokkaidō Agency (北海道庁). Hokkaidō became equal with other prefectures in 1947, when the revised Local Autonomy Law became effective. The Japanese central government established the Hokkaidō Development Agency (北海道開発庁) as an agency of the Prime Minister's Office in 1949 to maintain its executive power in Hokkaidō. The Agency was absorbed by the Ministry of Land, Infrastructure and Transport in 2001. The Hokkaidō Bureau (北海道局) and the Hokkaidō Regional Development Bureau (北海道開発局) of the Ministry still have a strong influence on public construction projects in Hokkaidō. Before the Meiji Restoration, the island of Hokkaidō was called Ezo or Yezo, and was mostly populated by the indigenous Ainu. When the Meiji Government was establishing the Development Commission (開拓使) it was decided to change the name of the island. Matsuura Takeshirō submitted six ideas, including names such as Kaihokudo (海北道) and Hokkaidō (北加伊道). The government eventually decided to use the name Hokkaidō, but decided to write it as 北海道, as a compromise between 海北道 and similar names such as Tōkaidō (東海道). According to Matsuura, the name was considered because the Ainu called the region Kai. Historically, many peoples who had interactions with the ancestors of the Ainu called them and their islands Kuyi, Kuye, Qoy, or some similar name, which may have some connection to the early modern form Kai. The Kai element also strongly resembles the Sino-Japanese reading of the characters 蝦夷 (Sino-Japanese /ka.i/, Japanese kun /emisi/), which have been used for over a thousand years in China and Japan as the standard orthographic form to be used when referring to Ainu and related peoples; it is possible that Matsuura's Kai was actually an alteration, influenced by the Sino-Japanese reading of 蝦夷 Ka-i, of the Nivkh exonym for the Ainu, namely Qoy. The name "Hokkaido" means "Way to the North Sea." 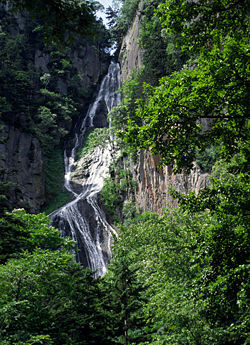 Sōunkyō, a gorge in the Daisetsu-zan Volcanic Area. 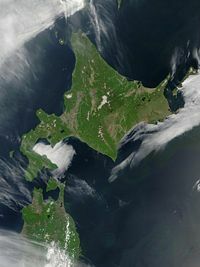 The island of Hokkaidō is located at the north end of Japan, near Russia, and has coastlines on the Sea of Japan (west), the Sea of Okhotsk (north), and the Pacific Ocean (east and south). It is separated from Honshu island by the Tsugaru Strait and from Sakhalin, Russia, by the Soya Strait. The center of the island has a number of mountains and volcanic plateaus, and there are coastal plains in all directions. With almost equal areas of mountains and of plains, Hokkaido is less mountainous and hilly and has more flatlands than the rest of Japan. Major cities include Sapporo and Asahikawa in the central region and the port of Hakodate facing Honshū. The Ishikari River, the second-longest river in Japan, traverses West Hokkaido; its valley is an important urban and industrial region. By Japanese reckoning, Hokkaidō also incorporates several of the Kuril Islands, whose ownership is disputed with Russia. Because the prefectural status of Hokkaidō is denoted by the dō in its name, it is rarely referred to as "Hokkaidō Prefecture," except when necessary to distinguish the governmental entity from the island. The island ranks 21st in the world by area. It is 3.6 percent smaller than the island of Ireland while Hispaniola is 6.1 percent smaller than Hokkaidō. By population it ranks 20th, between Ireland and Sicily. Hokkaidō's population is 4.7 percent less than that of the island of Ireland, and Sicily's is 12 percent lower than Hokkaidō's. Hokkaido is the most sparsely populated and second-largest of the Japanese islands, with an area of 30,107 square miles (77,978 square km). Together with several smaller islands, including Rishiri, Okushiri Island, and Rebun, the governmental jurisdiction of Hokkaidō constitutes an area of 32,247 square miles (83,520 square km). This is 21 percent of Japan's land area, but only 4.5 percent of Japan’s inhabitants live there. The population of Hokkaido is concentrated largely in the west and southwest, around the cities of Sapporo, Hakodate, and Otaru. Until 1800, the Ainu outnumbered the Japanese. There are now approximately 16,000 Ainu in Hokkaido. An earthquake of magnitude 8.0 struck near the island on 2003-09-25 at 19:50:07 (UTC). In 1993, an earthquake of magnitude 7.8 generated a tsunami which devastated Okushiri, killing 202. The Japanese regard Hokkaido as a place with a vast wilderness. It was only made an official part of Japan after the Meiji Restoration in 1868, and does not share Japan’s long history of clan wars and conflicts or its highly refined cultural traditions. Its place names are often adaptations from Ainu names. Even the foods eaten in Hokkaido are different from those popular in the rest of Japan, including a lamb dish called "Genghis Khan.” Japanese tourists enjoy traveling to Hokkaido to visit hot springs and enjoy its scenic beauty. Beautiful fields of colorful wildflowers bloom during the spring and summer, and the cool summertime weather attracts campers and hikers. In autumn, the leaves of the trees change to crimson and gold. In winter, the generally high quality of powder snow and numerous mountains in Hokkaidō make it one of Japan's most popular regions for snow sports. The snowfall usually commences in earnest in November and ski resorts (such as those at Niseko, Furano and Rusutsu) usually operate between December and April. Hokkaidō celebrates its winter weather at the Sapporo Snow Festival. The Winter Olympics were held in Sapporo in 1972. * designated a World Heritage Site by UNESCO on 2005-07-14. Map of Hokkaidō showing the subprefectures and the biggest cities. 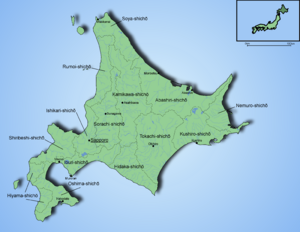 Hokkaidō is one of eight prefectures in Japan that have subprefectures or local offices (the others being Tokyo, Yamagata Prefecture, Nagasaki Prefecture, Okinawa Prefecture, Kagoshima Prefecture, Miyazaki Prefecture and Shimane Prefecture). However, it is the only one of the eight to have such offices covering the whole of its territory outside the main cities (rather than having them just for outlying islands or remote areas). This is mostly due to its great size: Many parts of the prefecture are simply too far away to be effectively administered by Sapporo. Subprefectural offices in Hokkaidō carry out many of the duties that prefectural offices fulfill elsewhere in Japan. Before the current political divisions and after 1869, Hokkaidō was divided into three provinces. 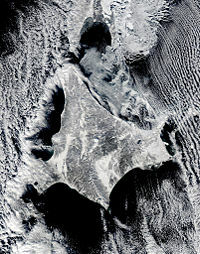 Satellite image of Hokkaidō in winter. Hokkaidō is known for its cooler summers and icy winters. Most of the island falls in the humid continental climate zone (Köppen Dfa (humid continental) in some inland lowlands, Dfb (hemiboreal) in most other areas). The average August temperature is around 22 °C (72 °F), while the average January temperature ranges from −12 °C to −4 °C (10 °F to 25 °F) depending on elevation and latitude. The island tends to see isolated snowstorms that develop long-lasting snowbanks, in contrast to the constant flurries seen in the Hokuriku region. Unlike the other major islands of Japan, Hokkaidō is normally not affected by the June-July rainy season and the relative lack of humidity and typically warm, rather than hot, summer weather makes its climate an attraction for tourists from other parts of Japan. During the winter, passage through the Sea of Okhotsk is often complicated by large ice floes broken loose from the Kamchatka Peninsula. Combined with high winds that occur during winter, this brings air travel and maritime activity almost to a halt on the northern coast of Hokkaidō. Former Hokkaido Government Office in Chuo-ku, Sapporo. Hokkaidō's largest city is the capital, Sapporo. Other major cities include Hakodate in the south and Asahikawa in the central region. Other important population centers include Kushiro, Obihiro, Abashiri, Nemuro. Hokkaidō has the highest rate of depopulation in Japan. In 2000, 152 (71.7 percent) of Hokkaidō's 212 municipalities were shrinking. Total shrinking municipalities in Japan in the same year number 1,171. Hokkaidō is Japan's predominant agricultural area, with an arable land area of approximately 970,000 hectares, nearly one-fourth of the nation’s total. It ranks first in the nation for its production of wheat, soybeans, potatoes, beets and other field crops, onions, pumpkins, corn and other vegetables, raw milk, beef and a number of other farm products. Most of Japan's milk and dairy products come from Hokkaido, and it is one of the world’s major centers for fishing. Forests, covering most of the island, are a source of lumber, pulp, and paper (milled in Hokkaido). Hokkaido’s forests cover 5.58 million hectares, 71 percent of the prefecture’s total land area and 22 percent of Japan’s total forest area. Hokkaido was the site of Japan’s first beer brewery, Sapporo, which remains one of the country's most popular. Although there is some light industry, most of the population is employed by the service sector. Coal, iron, and manganese are mined; the Ishikari coal field produces a major part of Japan’s supply of coal. Hokkaidō's only land link to the rest of Japan is the Seikan Tunnel. Most travelers to the island arrive by air: the main airport is New Chitose Airport in Chitose, just south of Sapporo. Tokyo-Chitose is the world's busiest air route, handling 45 widebody round trips on four airlines each day. One of the airlines, Air Do was named after Hokkaidō. Hokkaidō can also be reached by ferry from Sendai, Niigata, and some other cities. Within Hokkaidō, there is a fairly well-developed railway network (Hokkaidō Railway Company), but many cities can only be accessed by road. The sports teams listed below are based in Hokkaidō. Hokkaidō has relationships with several provinces, states, and other entities worldwide. ↑ National Census 2010 Preliminary Results Retrieved June 8, 2012. ↑ Japan Handbook, p. 760. ↑ Let the Sea Make a Noise: A History of the North Pacific from Magellan to MacArthur, 355–356. ↑ Let the Sea Make a Noise: A History of the North Pacific from Magellan to MacArthur, 357. ↑ Michael Hoffman, A Short History of Hokkaido. Retrieved August 19, 2008. ↑ Prefecture of Hokkaido, Hokkaido’s Business Environment. Retrieved August 20, 2008. Bisignani, J. D. Japan Handbook. Moon Publications Inc., Chico, 1993. Ferguson, Will. Hokkaido highway blues: hitchhiking Japan. New York: Soho Press.1998. ISBN 9781569471333. Greey, Edward. The Bear-Worshippers of Yezo and the Island of Karafuto (Saghalin): or, The Adventures of the Jewett Family and Their Friend Oto Nambo. New York: International Book and Pub. Co., 1899. Hokkaido (Japan). Hokkaido. Sapporo: Hokkaido Government, Living Enrichment Division, Dept. of Living Environment, 1983. Hokkaido and Tohoku Potters. Kyoto: Kyoto Shoin, 1993. ISBN 9784763687722. Kenna, Michael. Hokkaido. Tucson, Ariz: Nazraeli Press, 2006. ISBN 9781590051399. McDougall, Walter A. Let the Sea Make a Noise: A History of the North Pacific from Magellan to MacArthur. New York: Basic Books, 1993. ISBN 9780465051526. Refsing, Kirsten. Early European Writings on Ainu Culture: Travelogues and Descriptions. The Ainu Library, 2000. ISBN 9784931444195. Walker, Brett L. The Conquest of Ainu Lands: Ecology and Culture in Japanese Expansion, 1590-1800. Berkeley: University of California Press, 2001. ISBN 9780520227361. Watabiki, Kozo, and Hidezo Imaruoka. Hokkaido Photo Collection. Sapporo: Hokkaido Tourist Association, 1992. TransGlobal Highway – Proposed Hokkaidō-Sakhalin Friendship Tunnel. This page was last modified on 12 January 2018, at 15:31.